Some brands are very well-known in their own right, thanks to their founders, but it is the people that often work behind the scenes who help enhance your perception of the brand with their knowledge & experience. This certainly runs true when it comes to a Dr. Sebagh signature facial performed by facialist Tine Hagelquist, who has worked for the brand for many years. As spring started weaving its magic wand around nature, my own pale complexion emerged into the spring sunshine, looking for its own rejuvenation & re-awakening. Instead of a kiss from a handsome prince, it received Tine’s magic touch, enhanced by Dr. Sebagh’s skincare. When I arrived to have a facial, I though I was entering a secret dungeon, as I took the steps into the basement of Dr.Sebagh’s clinic, located in Wimpole street. While I haven’t met the handsome French doctor in person during my visit, I do know on good authority that he is adored by many beauty editors, supermodels like Cindy Crawford & Elle Macpherson (who travels with Dr. Sebagh’s Rose de Vie Serum & Supreme Day Cream) & many of his loyal clients of various ages simply because he tells them things as they are, never suggesting a treatment that his clients actually don’t need. 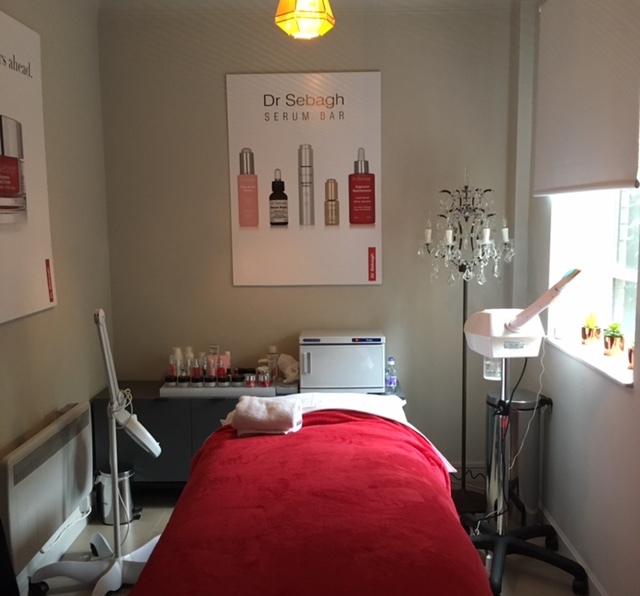 I was met at the door by the beaming Tine, who led me into the natural light streaming through the windows of the serene & artfully designed treatment room that was done by Dr. Sebagh himself – clearly a man of not a singular, but many talents! There is a little bathroom & a shower room, where you can re-apply your make-up after the treatment, if you so wish, a little kitchen, a sitting area, that combines comfort with an artistic touch & the actual sanctuary for the facial, a massage table covered in inviting red & white sheets, matching the packaging of Dr. Sebagh’s skincare. The whole place feels more like a peaceful artistic cocoon that nurtures creativity, as well as your complexion, rather than a skincare clinic or treatment room. As Tine knows me & my skin quite well, she brought me some water to drink, while we quickly caught up on our busy lives & I dived under the comfortably warm covers, having taken my jewellery off & leaving the day’s stresses at the door. Tine is a wonderfully vibrant person, but she also has calming & grounding vibes around her, that within minutes she imparts on you. As the grey light streamed through the windows & bird song caressed my ears, Tine put a cotton band around my hair, making sure nothing got in the way of her pampering my face, told me to take a few deep breaths & her nimble fingers got to work. The 60 minute facial starts with a double cleanse, using Dr. Sebagh Foaming Cleanser, which makes sure your skin is properly cleansed, before deeper work starts on it. As make-up & pollutants were cleared from face & neckline, Tine followed it up with citrusy-smelling Deep Exfoliating Mask, which was developed to boost skin’s natural glow, as well as to smooth & refine its texture (there are two versions of this mask, one for normal skin, with 17% Lactic Acid & one suitable for sensitive skin with 7% lactic Acid, so do check, if considering its purchase10. If you use it at home, you can do so once or twice a week, depending on your skin type. The mask is applied to clean & dry skin and is left to work for up to five minutes, before being removed with a face mitt, which has been emerged into warm water. Tine also applied the mask to my hands, which often give away our true age quicker than our faces, after which we tend to look much more diligently, all the while doing gentle pressure point massage on my face – around the eye, brows and sides of my face and with a little more vigour around my nose area. In my case Tine customised mask application by applying Perfecting Mask to my T-zone & Rose de Vie Hydrating Mask to the cheek area (it hydrates, soothes & regenerates your skin after each application. The mask was formulated by Dr. Sebagh in order to purify the top layer of the skin, helping skin look & feel more radiant when used as part of your skincare routine). That’s one of the things which makes Tine’s approach to each facial she gives quite unique – she examines your skin & chooses products accordingly, creating a personal experience just for you each time, within a Dr. Sebagh facial protocol. While I am not a huge fan of rose-scented skin or body care products, I enjoyed this mask as part of my facial experience, in part because it’s scent is subtle, not overwhelming & secondly because it has light, gel-like texture that also imparts a cooling sensation on your skin as soon as it is applied, making it particularly effective on those days when you feel hot & bothered. After removing the masks from the face & hands, Tine applied High Maintenance Hand Cream – something I forget to do regularly, even though I have various hand creams dotted strategically by the sink & bedside table at home – one of the benefits of having a regular facial & having other body parts pampered, as part of your treatment. One of the best parts of this facial for me was the lymphatic massage done on the face & neck with Rose de Vie serum (it’s a lightweight oil-like texture sinks into your skin within seconds, but still allows the facialist to effectively massage your face), that is really akin to a workout for your face, but done by someone for you, as you lie down & enjoy a rare moment of tranquility in the middle of a busy city. While many of us do skin brushing at home on our bodies, thus promoting lymphatic drainage that helps our bodies get rid of toxins & stagnant energy, our faces don’t get the same treatment. Tine recommends doing it daily – you don’t have to be a facialist to master the technique – just ask the facialist to teach you & do it every morning or night, as part of your skincare routine & you are sure to notice a difference in your complexion within weeks, if not days! Tine also does a strong, but not at all unpleasant pressure point massage, which helps to release the tension from the jawline, sinus & eyebrow area – this feels like a happy tsunami on your face, something that I haven’t experienced before. As your face feels like it is a grip of the stormy sea, you physically feel tension leave your face, giving way to relaxed, more radiant complexion & uplifted mood. Bliss isn’t the word for it & I can’t recommend it highly enough – I almost wish Tine did this on my face daily, as it feels THAT good! If that wasn’t enough, you facial massage also extends to your neck & shoulders, as well as the upper spine, as Tine’s strong & experienced fingers reach those points where tension finds its permanent residence (those who work on their laptops at their desks will know exactly what I am talking about), so knots come undone & tension literarily floods out of your body, as you breathing calms down. Your skin is cocooned in a thick layer of the brightening & firming mask, which combined with vigorous massage technique wakes up your skin, as your circulation is boosted – I so wish Dr Sebagh develops the same technique for a body treatment one day, as let’s be honest, our faces might be our calling cards, but our bodies are the machines that move us all forward into the future. As I struggled not to succumb to a happy slumber (after all, I had to remember the finer points of the treatment in order to share it with you, my dear reader), Tine removed the mask with warm mittens & applied Serum Repair, a moisturising collagen booster with hyaluronic acid that you can apply on its own or under your usual moisturiser, mixing some Vitamin C Powder Cream ( which brightens the skin & supports the process of collagen production by your skin ) & adding a few drops of Supreme Maintenance Serum (a firming serum containing resveratrol). If that wasn’t luxuriously pampering enough, Tine added some High Maintenance Cream (if that doesn’t make you feel like Cleopatra, I don’t know what will). My neck also got some love with the application of the Supreme Neck Lift ( I don’t know if that was age-proofing strategy or Tine gently reminding me that I am no longer a teenager :)))). Another point worthy of note – during the facial Tine also used some feathery strokes, which I thought were her fingers, yet, in fact they were two cotton wool pads soaked with water that caressed the contours of my face like the lightest, silkiest brush that a curator might use to clean a rare book – a very sensual & relaxing sensation that puts a contented smile on my face, as I type away & try to give you a description of what it felt like. Tine let the products sink in and then applied Anti-Pollution Anti-Oxidant SPF30 all over my face, neck & even my ears, told me to stretch my arms & legs away from my body, taking some deep breaths. This little ritual helped me float gently back to reality & gather my thoughts. Within a few minutes I felt fully awake & ready to surge ahead with my day. When I was ready to sit up, Tine showed me my face in the mirror – a relaxed, dewy, glowing complexion with no sign of dehydration (do you, unlike me drink enough water daily, thus keeping all of your cells plumped up & hydrating, working at full, not sleepy capacity?) or late nights? She also reminded me that one shouldn’t focus on one’s age, but instead try to live each day with a positive attitude, no matter what life brings along – it times of current uncertainty & certain dangers those words seem particularly poignant & relevant. After seeing Tine you can expect to emerge with lots of helpful tips on not just skincare, but wellbeing & nutrition as well. You can also fall asleep with a tired complexion & wake up towards the end of a treatment with a naturally glowing & revitalised face & mind. But that’s not all – when you book in for this signature facial, you will also walk away with a Dr Sebagh product kit, allowing you to have a personalised & scientifically designed skincare routine in the privacy of your home. Each product has been developed by Dr. Sebagh & his team with modern women & their skincare needs in mind & made in France, so you can be sure of the quality of the products. What I also appreciate as consumer is simple names of products, each box telling you the aim of this product, with no bogus claims or misleading labels. For me having a facial is part of the rare, but essential ‘me-time’, so it has to be be so much more than just fluffing about or cleansing or mask application – I can do it myself, in the privacy off my own bathroom. When I have a facial I look for not just some tranquility & pampering, but for elements that enhance the experience, massage being a big part of that. Tine’s massage technique re-awakens the muscles & helps reveal the dormant strength and beauty of your facial muscle structure. Tine rolls & taps her fingers all over your face, neck & decollate, with Dr. Sebagh skincare creating a perfect canvass & allowing the facilist’s fingers to glide effortlessly with no pinching or dragging of your skin. When you have a facial, you don’t want the faciliast to slap the mask on your face & just walk out, while you twiddle your fingers & beat yourself up mentally for parting with money & having no fun while you are at it. This facial allows you to engage with your facialist, relax & learn, while your skin is nurtured & facial muscles are exercises vigorously. Tine is a naturally positive person, so you can count to emerge from her Dr. Sebagh treatment room in a relaxed & happy mood and with a pampered, glowing complexion, which will look even better several hours after the treatment – I actually continued without a trace of make-up for the rest of the day – bar a few strategic gentle pitches on my cheeks to bring some more colour into my cheeks. A very special signature Dr Sebagh facial performed by knowledgable caring hands – and I can’t recommend the face tsunami strong enough! I felt like a super surfer on the crest of a wave facing the sun glinting on the water surface. One hour of pure, pampering bliss! As I got ready to leave, Tine reminded me to start each day with a cat-like stretch before getting up from my bed & saying a mantra ‘it will be a happy day’. She also shared a juice recipe that she starts her day with: juice ginger & pineapple, add a pinch of black pepper & turmeric, drink it up & then go & brush your teeth & get on with your day, helping your body & mind start the day on the right note. Suffice to say I left an even more adoring fan of Tine’s than I was when I arrived on Dr. Sebagh’s clinic steps.